What with one thing and another, I’ve spent very little of my life to date traveling outside my home country, which meant that our surprise trip to Costa Rica in June provoked a rare dilemma. I hadn’t expected to get to Costa Rica for years yet, and now — given financial realities and the number of other places we still haven’t been — it’s not especially likely that I’ll go back a second time. It was an outrageous departure from my ordinary life, and I wanted to bring something tangible back. However, I am picky. I mean, really, really hard to please. First of all, anything I bought had to be something we would display permanently in our house, because I think souvenirs in a box are just pointless. Souvenirs should spark memories and conversation, and for that they need to be visible. Plus, it would have to be beautiful in its own right. I happen to think most typical souvenirs — refrigerator magnets and t-shirts and so on — are tacky. I am irritated by small knickknacks, and I consider collecting a bunch of anything — salt shakers or shot glasses or spoons — to be a waste of space and money. I’m a huge fan of photographs as souvenirs, but I lack both the type of camera and the level of skill required to generate really good ones. Someday I hope to rectify both of those deficiencies, but it wasn’t something I could manage in the three months between finding out that we were going to Costa Rica and being there. I did my best, and occasionally I got lucky with lighting and composition, but my little point-and-shoot Canon can’t handle much in the way of zoom or depth-of-field adjustments. I’m happy to have the photos I’ve got, but even the best ones are not worthy of wall display. I had some idea of what would make a good souvenir, however, because I’d lucked into one before. 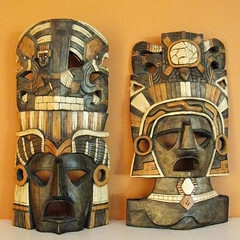 On our one other trip outside the States, to the Yucatan in 2008, Jak and I returned with a pair of hand-carved wooden masks that I bought from a small roadside vendor. Four years later, I’m still pretty happy with them — they were inexpensive yet attractive, and they remind me of the day we spent touring the Mayan pyramids. So I know that handmade crafts tend to do it for me, if they’re reasonably authentic and large enough to be out of the bric-a-brac category. 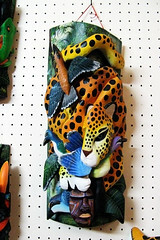 I wanted something both tastefully decorative and uniquely Costa Rican in nature, preferably something that would hang rather than sit. While we were still on the first, family-sponsored part of the trip, our tour group of fourteen in-laws stopped at a large souvenir shop. It had everything from one-inch trinkets to carved statues four feet high, including a wall of vividly painted wooden masks made by the indigenous Boruca people in the southern part of the country. I looked at the masks long and hard, and made the circuit of the entire store three or four times. I really wanted to buy a souvenir. But I was also wary of miswanting, and conscious of the limits of my budget. Everything non-essential comes out of a capped pool, which introduces stark trade-offs into the equation. As I circled the showroom, I kept coming up with two insurmountable problems with buying anything. One, everything in the store that I actually liked was painfully expensive. The Boruca mask in the photo was beautiful, but in the neighborhood of $200 U.S. That’s quite a bit more than I felt comfortable spending. I could, maybe, just barely have squeezed that out of my personal budget, but it would have hurt a lot. Two, the shopping experience was completely disconnected from our trip experience. That’s sort of a hard thing to explain, so let me give a counterexample. I didn’t feel particularly compelled to buy a souvenir for myself in Ajijic, I suppose because it didn’t feel like a once-in-a-lifetime experience. But we did buy a necklace as a thank-you gift for the friend who was at home housesitting for us (and dealing with our Bad Cat, among other things). It was a combination of polished stones and intricate tiny macrame, and cost about $30 US — expensive enough to make me wince, but surely a fair price for as much work as it must have been. I bought the necklace directly from the artist herself; she had a table display at one of the local tianguis that we visited every week. Communication was challenging, because she spoke almost no English, leaving me to muddle through with my poor Spanish. But meeting and speaking with the artist, even through the language barrier, left me feeling connected. I was, and still am, happy to spend the money because of that connection. By contrast, buying a mask from this air-conditioned tourist trap of a store just felt wrong. Since we were going nowhere near the actual village of Boruca, the masks were not a real part of our trip experience. I felt no more connection to their origins than I would have if I’d purchased one over the Internet, or at Costco. I want to remember waking up to the patter of rain and toucans that sound like frogs. If I’d bought that mask and hung it on the wall, I’d think of the souvenir shop every time I looked at it. I do not particularly want to remember the souvenir shop. I want to remember the jungle and the boats and the friendly staff at the lodge, who were so happy to help me improve my Spanish. I want to remember waking up to the patter of rain and toucans that sound like frogs. 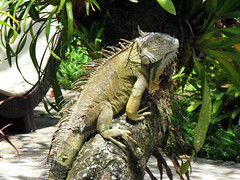 I want to remember the herons and the monkeys and the iguanas and yes, even the mosquitos. The other twelve people in our family group left the store bearing multiple packages. Only Jak and I walked away empty-handed. As we were at that point only halfway through the trip, I held out hope that a better opportunity would arise later. It never did. In the end, instead of purchasing any kind of souvenir from Costa Rica, I just kept some cash. Costa Rican paper currency — like the currency of nearly every other country on the planet other than my own — is beautiful. I especially like the back illustrations, all of which depict native wildlife. 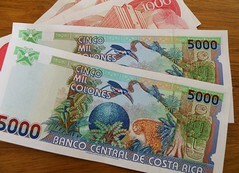 My favorites are the vivid blue underwater scene on the 2000 colón bill (about $4 US) and the jungle scene with toucan and jaguar on the 5000 colón bill (about $10 US). My idea is that we can put the colóns in small frames together with some Mexican pesos as a souvenir of our 2012 gallivanting. Maybe in a few years we’ll be able to travel more and we can collect a whole Central American set. Strangely, money itself meets all my criteria for a satisfying souvenir: it’s inexpensive, it’s attractive, it’s displayable, it’s unique to its country of origin. I handled colóns every day of our trip, so it’s grounded in real memories. And as a bonus, cash — even foreign cash — is one kind of souvenir with decent resale value. In case of emergency, we can just break the glass. Have you ever bought a souvenir that you later regretted? What’s the best souvenir you’ve ever come home with? As I’ve downsized my junk volume over the past few years, I’ve gone over to tiny little souvenirs like shot glasses and postcards. I love your framable money idea; as you travel, you add to a wall display that is beautiful and sparks interesting conversations. Our favorite souvenirs have been food items. We brought back smoked Spanish paprika from Barcelona and salt from Peru, evaporated by salt ponds that have been in use since the time of the Incas. Every time I reach for a souvenir ingredient, I remember our trip vividly. Sure, we’ll run out eventually, but I bet that even when we use US-bought ingredients in the future, they’ll still evoke a Proustian response. We also bought a set of drinking glasses in Morocco. I regret only buying six, as we’ve managed to break two so far. They were only 30 cents each, and we use them every week (and so are reminded of Morocco every week). I actually regret not spending more money on a Moroccan wedding blanket. Ours was cheap because it had a weird pink stain in one corner, which I thought we could get out with dry cleaning. No luck. We should have spent twice the money for a nicer one. I love bringing back food (and drinks)! But I didn’t consider them proper souvenirs because, you know, they’re inherently temporary. We brought back some coffee beans and a large bottle of Salsa Lizano from Costa Rica. Sadly, airline restrictions rule out a lot of consumables. Aw, fridge magnets are awesome! Cheap and cheerful. I started collecting them from places my husband and I travel to together, and my only regret is that I didn’t get more from the earlier trips (and that my fridge is one of those European under-the-counter things so I have to bend down to look at them…). Mostly I like things that have practical use – my spoon rest is from France, and has cows on it (speaking French, of course), and my bathroom wastebasket is a pink pig from Japan. These are things I’d need to buy from *somewhere* and this is far more interesting than the offerings at Bed, Bath and Beyond, as well as being (as the commenter above pointed out) a regular reminder of the trip. Of course, this can backfire, as I also have a package of adorable sponges from Japan (smiling fruit) and I cannot bear to actually use them…. I can appreciate that fridge magnets are useful and don’t collect dust! And I could see them as souvenirs from someplace inherently commercial, like Disney World. But for foreign countries, I don’t want a mass-produced thing stamped ‘Mexico’ or ‘Costa Rica’. I love the spoon rest and the wastebasket. They sound charming! I see your blog needs some unique & fresh content. Writing manually is time consuming, there is tool for this task.